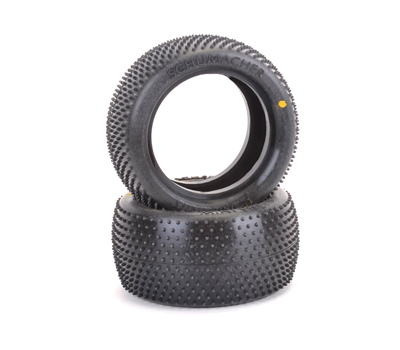 The Schumacher Mini Pin became the market leading tyre for 1/10th buggy carpet racing. This tyre performs particularly well on indoor carpet tracks. The MiniPin is particularly good when the track is multi surface offering good grip on gym floor and wood as well. A popular tyre at our local clubs Caldicot R/C Racers and COBRA Cardiff on the rear of 1/10th 2wd and 4wd buggy.